"Take up his cross, and follow me"
Problems and challenges are faced everyday. Yet we always complain that life is hard and we whine that we want to give up. I always complain about my struggles in life and it is not easy for me. But as I reflect on it, Jesus also suffered during His time. His experienced sufferings is far greater than what I have right now. I am a sinner yet I do not need to crucified on the cross. But Jesus did. As a sinless man He died on the cross for the sake of mankind. I personally want to follow Jesus and His ways. But I know it will not be very easy. It will not be easy because Jesus' life was not easy either. He accepted the cross that is not intended for Him. The cross was so heavy that He fell while carrying it. It was so heavy that even Simon of Cyrene's help was not enough. I do want to be with Jesus and live Him. And I must take my cross and follow Him. My cross is my life. I must live it making Christ as the center, to grow in faith, live the faith, and share the faith. I must remember that after the death of Jesus is the resurrection. At the end of my trials, I have faith that there will be light. 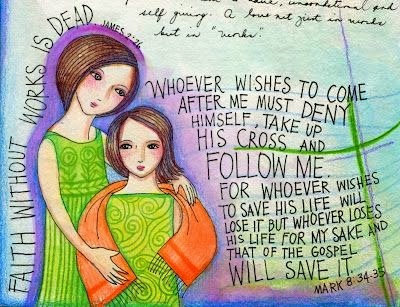 My prayer for this, "Lord, teach me to carry my cross and follow Your way. It will not be easy but I know You will always be with me. There will be times that I want to give up. But I pray that You will give me strength to endure all my sufferings. As you resurrected from the dead, please raise me up in my sufferings. Amen."